Watch this interview with Jon and see how he does it. For maps and detailed instructions, see below. Bike Share in Manchester. City residents, employees, and visitors can affordably rent bicycles to traverse the city. Sponsoring businesses include Southern New Hampshire University, McLane Middleton, Puritan Backroom, Granite YMCA, and Martignetti Companies. 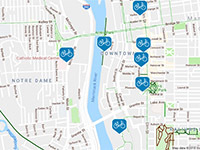 Plans call for expanding the local bike share system as additional sponsors are secured. NHDOT has a bridge for sale!.Complete streets project or trail connections otherwise thought unfeasible? The bridge currently spans I-93 in Londonderry. Left: Ash Street Bridge over Interstate 93 in Londonderry. 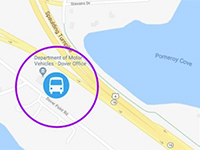 On March 6, the Governors’ Institute on Community Design provided NHDOT with technical assistance toward meeting New Hampshire's pedestrian, bicycle and transit transportation safety and access needs with practical solutions. 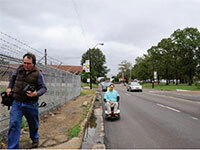 See https://smartgrowthamerica.org/six-state-dots-selected-receive-hands-assistance/ . NHDOT leadership, project managers and engineers, municipal leaders, planning commission staff and others attended the workshop. See the Institute's Recommendations. 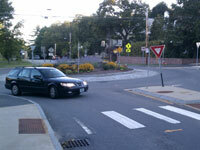 Roundabouts work in New Hampshire to increase capacity, reduce delay and virtually eliminate serious collisions. 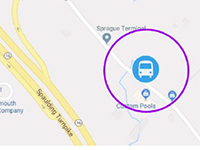 Most important for pedestrians, roundabouts can be designed to make New Hampshire roads and neighborhoods more accessible. The Department provides information on how to use a roundabout whether you walk, bicycle or drive a motor vehicle. This Youtube video about a Glens Falls, New York roundabout may remove all doubt in your community. A feature article in the ITE Journal explains the safety benefits of roundabouts. While "green" bicycle tourism leaves a small footprint in New Hampshire. New Hampshire's attractiveness to tourists may partly be our courteous New Hampshire motorists, as Robert Messenger from New York City found. Keep Equestrians and Their Animals Safe. How fast should you drive by a horse? How close should you get? Just think about how fast and close you want others to drive by your own animal. 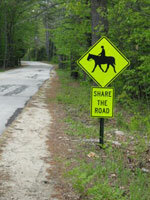 Check out this equestrian safety publc service announcement from Vermont. New Hampshire law requires vehicle operators to avoid frightening a horse. Ann Poole provided this picture taken along Beard Road in Hillsborough. 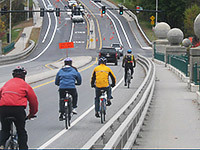 USDOT invites the American public—including the users, developers, owners, and operators of the transportation network and the policy officials who shape it—to have a frank conversation about the shape, size, and condition of that system and how it will meet the needs and goals of our nation for decades to come. Find out more at the Beyond Traffic webpage. Self-driving cars. 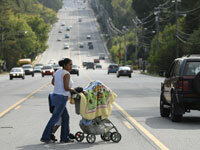 - Two Views: What would it be like to be a pedestrian? Actually pretty good according to Adam Millard-Ball, assistant professor of environmental studies at UC Santa Cruz. A November 4, 2016 Science Blog explains why. No, not so good according to Tech Engineer Pablo Valerio in Cities of the Future. A March 17, 2017 article explains why.